Want to have a Slow Loris Pet? Here's everything you'll need to know. So You Want A Slow Loris Pet? So you’ve heard or seen someone who has a Slow Loris Pet, and now you also want one as a pet!? Join the club! Thousands of people have seen how cute these creatures are, and are mesmerized by their wide eyes and seemingly gentle disposition. However, there’s a dark side to these slow moving primates which will have you thinking twice about getting a Slow Loris pet! What is a Slow Loris and do I really want a Slow Loris Pet? All of the species are native to India, Borneo, Vietnam, Bangladesh and parts of China. The heaviest slow loris is around 2 kilograms, or 4.4 lb.. They can be anywhere in length between eight to sixteen inches. As you can tell from the picture, the slow loris has very distinctive facial features including a round face with huge, bulging eyes. Occasionally, they will have a dark stripe in the middle of their back, which runs down to their tail. These little guys are nocturnal, and like a lot of similar looking creatures, spend most of their time hanging out in trees. In fact, they are often seen sleeping in trees during the day, and because of specialized bloody vessels and internal makeup, they are able to hang on to branches for extremely long amounts of time without getting tired or cramped! 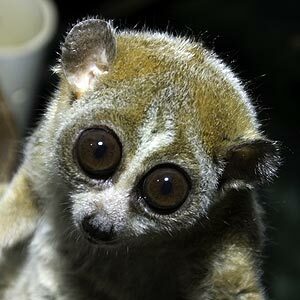 No Really, Can I have a Slow Loris Pet ? In most parts of 1st world nations, it is either illegal, or a paperwork nightmare to get a slow loris pet. If that doesn’t discourage you enough, just wait, it gets better! 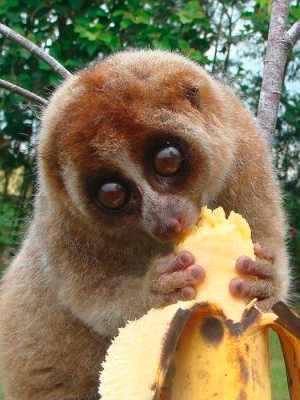 One of the main reasons that you wouldn’t have a slow loris pet for long is because of their diet. They tend to only eat rare fruits found in and around their normal environments. So if you live in the US, UK, Canada, Australia etc, you’re going to be out of luck. Unless you like constant grocery trips to Bangladesh, Cambodia, Indonesia, Thailand to feed your slow loris pet! Yes, I see one eating a banana up there all cute like, but they can only eat so many bananas before they’ll start having health problems. Which leads up to another good point: If your slow loris pet gets sick, you can’t take it to a vet unless you are a zoo with a proper license. Unless the vet is operating out of a van in an alley, the vet will seize your slow loris pet and you can be hit with up to $5000 in fines depending on the laws in your country. If you don’t take it to a vet, you will have a very dead slow loris pet. The slow loris has very sharp back canine teeth, which incidentally it uses to inject a foul smelling toxin that it excretes from its elbows… more on that later. Because your slow loris pet uses these teeth to bite things, like people, the folks who sell these creatures usually remove the teeth before they sell the slow loris, using pliers and no anaesthetic. This is, of course, horrible treatment and an extremely cruel method used by the seller. Not only that, but having those teeth removed means that your poor slow loris pet can’t eat its food properly! The slow loris usually uses those teeth to rip apart meat that it would find in the wild, like little lizards, reptiles and other live animals. Now, back to the elbows of your slow loris pet! Your super cute slow loris pet actually secretes a horrible smelling toxic ooze from its elbows, it licks the ooze and then delivers it with a bite to who or whatever is bothering it, i.e. you. Having the canine teeth removed however doesn’t totally stop them from biting, in fact they still have a lot of razor sharp tiny teeth which will just as easily deliver the poison through your skin. Those tiny teeth are specially curved, almost like a snakes fangs, ready to jab you with slow loris poison elbow ooze! If you are bitten by your slow loris, be warned that the toxin may cause severe to fatal anaphylactic shock! You’d think that having a pet which injected you with stinky poison would be enough, but not for the slow loris. This pet has a voracious need to mark its territory, all the time. For as long as it is alive (which usually isn’t long in captivity). Just like a dog with a bladder problem, the slow loris will urinate all over your house, yard, car, whatever. It doesn’t care. It is a pee marking machine. The slow loris and its urine marking is unfortunately not something that can be trained ‘out’ of it either. It is instinctive and is just what they do. So what are my other options!? Well, if the thought of owning an endangered animal which probably had its mother killed by hunters so you can make cute YouTube videos of it makes you a bit queasy, perhaps you should check out the many other animals available for adoption today all over the place! While the thought of owning a slow loris pet sounds appealing on the surface, you now know a lot of the truth behind having a slow loris pet! If you look around this page, you’ll find links to many other animals which are totally legal unlike a Slow Loris Pet, ones that won’t put you into a coma with poison, and don’t need to be captured in the wild! Now go! Look around here, click some links, and you’ll find some more adorable animals!